The upset win of President Harry Truman over Thomas E. Dewey in the 1948 election came after leading publications had confidently predicted Dewey's victory (e.g. 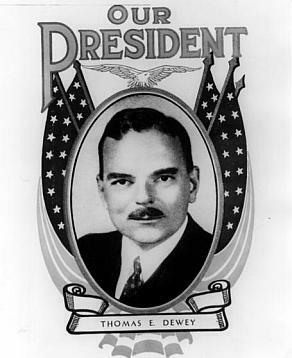 New York Times headline: “Thomas E. Dewey’s Election as President is a Foregone Conclusion”; Life Magazine: cover with Dewey's picture and caption reading, “The Next President of the United States"). 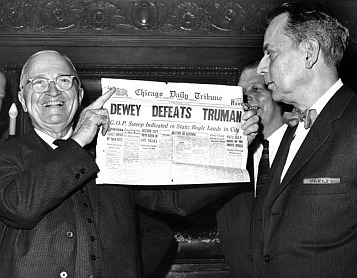 Even on election night, the media still had difficulty accepting the fact that Truman could win (see photo). Shortly before his inauguration at a dinner of the Presidential Electors Association, the President also gleefully parodied the radio reports of the prominent broadcaster H. V. Kaltenborn, who on election night commented that the President's lead in the early returns was unlikely to hold. The election also was marked by Truman's overcoming splits in the Democratic Party on civil rights and the Administration's policy directed at containing Communism. In an impassioned speech at the Democratic National Convention, then Minneapolis Mayor Hubert Humphrey spoke in support of a minority report proposing much stronger support of civil rights in the Party's platform. After Truman indicated his backing for a stronger civil rights position, the entire Mississippi and half of the Alabama delegation walked out of the Democratic Convention. Subsequently, the disaffected southerners then nominated South Carolina Governor Strom Thurmond to run as the nominee of the States Rights Democratic Party, or so-called "Dixiecrat" ticket. Another split occurred when more liberal Democrats, who objected to the President's confrontational policies toward Communism, organized the Progressive Party, with its presidential choice Henry Wallace, a former vice president under Franklin D. Roosevelt and cabinet member for both Roosevelt and Truman until being asked to resign by Truman in 1946. Thurmond carried four states--Louisiana, Mississippi, Alabama and South Carolina--with 39 electoral votes, but Wallace, despite nearly matching Thurmond's popular vote share with 2.4%, failed to win any electoral votes. 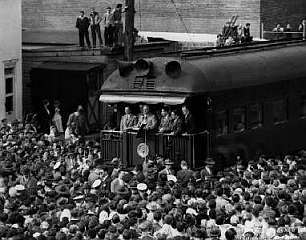 Another feature of Truman's 1948 race was his famed "whistle-stop" train campaign in which he gave speeches to crowds from the back of the special train chartered by the Democrats. In Boston, an estimated 20,000 people gathered to hear him speak at the station, and in all the President traveled over 30,000 miles and made some 200 stops on the "whistle-stop" route. In addition to allowing Truman a relatively efficient, economical way to get his message out, the use of the train also reinforced his popular image as a leader who avoided pretense and understood the problems of the average voter, a perception that ultimately won over voters when faced with the choice of the rather aloof and haughty Dewey. Truman's success with the "whistle-stop" campaign continues in contemporary political races, where candidates seek to replicate the Truman model of reaching out directly to voters, now often through marathon bus or walking tours.